I know what you’re thinking: any guy can claim to be an expert on something when it’s his own blog. Yet in this case, it’s true: I’ve worked as a genetics researcher for the last decade, and co-authored more than 50 publications in Nature, Science, JAMA, the New England Journal of Medicine, and other journals. Currently, I manage the human genetics group for one of three NIH-funded large scale DNA sequencing centers in the United States. MassGenomics, my work-related blog, is where I do most of my writing about DNA sequencing and its impact on our understanding of genetics. If I had to pinpoint a common theme among misconceptions about genetics in fiction, it would be oversimplification. Straightforward, guaranteed patterns of inheritance might fit nicely into your storyline, but they’re not the way the biological world works. Here are some common myths that I see, not just in sci-fi, but in other genres as well. 1. Genetics has (or will have) awesome predictive power. The Human Genome Project (HGP) officially met its goal in 2003, when the public-private consortium published their draft assembly of our genome (24 chromosomes, 3.2 billion base pairs). Even though this was more than ten years ago, you probably noticed that we’re not living in a GATTACA world. Not that we haven’t learned a tremendous amount about the content and function of the human genome, of course, but understanding the relationship between “genotype” (changes at the genetic level) and “phenotype” (changes at the physical level) has proven difficult. That’s because the phenotypes we study are often complex ones that arise from a number of factors including genetics, environment, diet, age, etc. Predicting the outcome from genetic information alone is tough. It’s common to hear phrases like “You’ve got good genes,” or “I got the gene for ___ from my father’s side,” as if having (or not having) a gene causes some effect. This is more of a terminology issue than a true misconception, but I thought I should make it clear: Technically speaking, we all have the same set of ~20,000 protein-coding genes. It’s the genetic variation within and around these genes that gives rise to individual differences. In rare cases, someone will truly be missing one or both copies of a gene because of a genomic deletion event, but that’s usually bad news: now the protein encoded by that gene will be absent. Such large-scale deletions are rare, but they’re often found in patients with severe genetic disorders. You’ve probably seen this cliche somewhere: a character figures out that someone is really his/her long-lost father because they share the same eye/hair color or peanut allergy. Yes, many of the traits underlying physical appearance have a genetic basis. Anyone who’s had kids can tell you that. Yet it’s not always straightforward, and certainly not something I’d rely upon for pseudo-genetic testing. Last year on my genetics/genomics blog MassGenomics, I debunked two human genetics myths, eye color and hair color. The major locus that controls eye color is on chromosome 15, but as many as 10 different genes affect it. Further complicating the issue is the fact that eye color can change, particularly in the first few months of life. A lot of babies are born with blue eyes that eventually become brown or green. Handedness is another common miconception: twin studies show that genetic factors only influence 25% of hand preference. If two left-handed parents have a baby, there’s only a one in four chance that the child will be left-handed. Case in point: my wife and I are both lefties, but two of our three kids are right-handed. If we took two people and compared their genomes, base by base, we’d find around 3 million differences. That sounds like a lot, but it’s about 0.01% of the genome. In other words, we’re all 99.99% identical at the genetic level. It is not correct to describe these differences as “mutations”. The term mutation implies the change of DNA sequence: the event during which one base becomes another. The differences you have did arise by mutation, but they did so a long time ago. 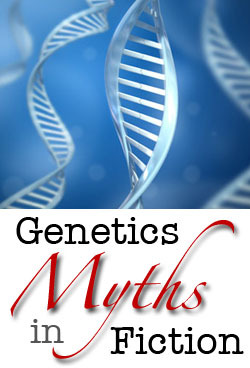 In truth, virtually all of your genetic variants were inherited from your parents. New mutations do arise between generations, but they’re incredibly rare: you might have about 30 or 40 new variants that your parents don’t have, in 3.2 billion base pairs. Maybe one of those is actually in a gene. Despite everything I said about the complexities and uncertainties in genetics, there are some aspects that we understand rather well. Many of these are rare genetic disorders whose inheritance pattern and genetic basis are well known, like Huntington’s Disease. HD is a late-onset (middle age), caused by mutations in the HTT gene on chromosome 4. It’s autosomal dominant, meaning that if one of your parents has it, you have a 50% chance. And because it’s late-onset, you won’t know (without genetic testing) until you’re well into adulthood. The OMIM Database is a good place to look for information about rare, well-studied genetic disorders. You’ve probably also heard of the BRCA1 and BRCA2 genes, in which rare mutations can predispose to many forms of cancer, especially breast and ovarian cancer. There’s also a gene called apolipoprotein E (APOE) which is linked to Alzheimer’s Disease. There are three alleles (forms of variation) in the gene called ε2, ε3, and ε4. APOE ε2 is relatively rare and may provide some protection against the disease. If Alzheimer’s disease occurs in a person with this allele, it develops later in life than it would in someone with the APOE ε4 gene. APOE ε4 is present in about 25 to 30 percent of the population and in about 40 percent of all people with late-onset Alzheimer’s. People who develop Alzheimer’s are more likely to have an APOE ε4 allele than people who do not develop the disease. Outside of the well-understood genetic disorders (which usually have genetic testing available), most of the genetic effects that we have found are a matter of probability, not certainty. It’s not guaranteed that, if you have a mutation in BRCA1 or BRCA2, that you’ll get breast cancer. It’s must far more probable. In genetics, we often represent the risk as an odds ratio, which is the odds that a person will share a genetic trait (i.e. get a disease) if they have a certain variant, compared to if they don’t have a certain variant. For example, a genetic variant with an odds ratio of 10 means that, if you have the variant, you’re 10 times more likely to get the disease. It doesn’t have to be a disease, though. It could just as easily be a trait like red hair. In terms of predicting what traits and diseases a person might have, family history remains one of the most powerful indicators. If you’re a woman and your sister, mother, or grandmother had breast cancer, you’re in a high-risk category. You don’t need a genetic test to know that. Much of our understanding about the human genome, genes, and inheritance is changing. Experienced geneticists know that there are few absolute certainties. Groundbreaking and unconventional discoveries happen all the time. Believable scientists in your fiction should be aware of the limitations of knowledge. They should talk in terms of probability. And they should freely admit that we can’t always predict the future, even with genetics. Dan, I truly enjoyed the article. I am writing a story in which I rank scientific accuracy as the highest quality. I would love to pick your brain to make certain it is up to your standards. Please email me if you’d like to help. I hate it in fiction where the daughter is a physical carbon copy of her mother or the son is the same thing to his father. That isn’t realistic. I”m one of those babies whose eyes changed from blue to green – but my change came in my late 20s. I went from a pale blue to a pale green.